I have talked about all sorts of wedding details that some brides probably haven't even thought about. Nail color. Facials. And now, perfume! Seriously though, do you know what you want to wear on your wedding day? One of my bridesmaids, Shena, gave me this wonderful gift for my birthday. 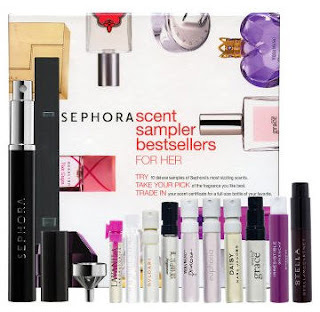 It's the Sephora Scent Sampler. Filled with many samples, the recipient can try them each out. When you find your favorite, you bring in the voucher to the store for a full size bottle. Is that not genius? As much as I loved the idea, I am tied to the idea of a "signature scent." 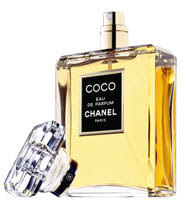 I have always said that when I am older (very vague and not quite defined) that I will start wearing Coco by Chanel. I love the way it smells. Ultimately, I decided to hold off on starting to wear this perfume. Switch over from what? 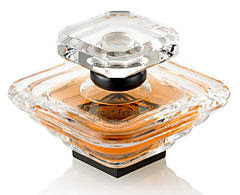 Tresor by Lancome is the perfume that I have worn for the past 15 years. My husband loves it. I have friends tell me that whenever they smell Tresor, they always think of me. It makes me happy. Although, I know that it is "in" to change scents for different occasions, seasons, etc., it is my thing. However, after a quick google search, I can see that I am not the only one that wants a signature scent. A recent Honey Bee Weddings bride wore her favorite perfume, Jo Malone Pomegranate Noir. She mixed it with Orange Blossom, a tradition for brides in France. Her plan is to wear the perfume on every anniversary. It's a sweet (although expensive) tradition. Regardless of what you decide to wear, just make sure that you love it! Misse I recieved the sampler as a christmas gift and I loved it! I've worn Coco Chanel pretty much every day since I was the ripe old age of 22. :) It just... fits. Boyfriends, sisters, and coworkers all love it, and I feel naked without it now! Ditto on the Coco Chanel here. I don't think you need to be an older woman to wear it--it's a classic scent that works at any age.